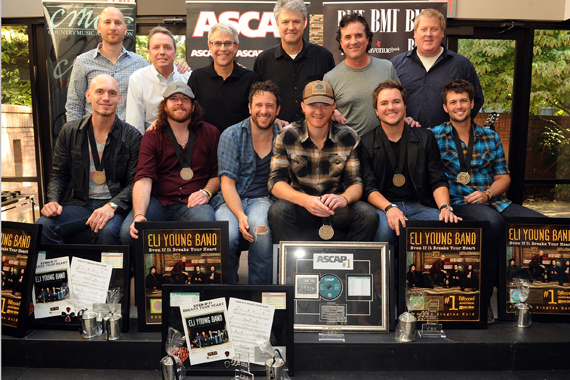 Front Row (L-R): Eli Young Band’s Jon Jones and James Young, co-writers Will Hoge and Eric Paslay, Eli Young Band’s Mike Eli and Chris Thompson; Back Row (L-R): Triple 8 Management’s George Couri, BMI’s Jody Williams, Big Machine Label Group’s Jimmy Harnen, Cal IV Publishing’s Daniel Hill, Big Machine Label Group’s Scott Borchetta, ASCAP’s Mike Sistad. Republic Nashville’s Eli Young Band, comprised of members Mike Eli, James Young, Jon Jones, Chris Thompson, and songwriters Will Hoge and Eric Paslay gathered yesterday (8/20) to celebrate their recent No. 1 song, “Even If It Breaks Your Heart.” The track made it to the top of all three charts, Billboard, MusicRow, and Country Aircheck. Held at the CMA offices, the party was standing room only for the crowd of industry enthusiasts, friends and family. The song is the second single from EYB’s current album Life at Best, produced by Mike Wrucke. CMA’s Steve Moore welcomed the attendees followed by presentations from BMI’s Jody Williams, ASCAP’s Mike Sistad, Cal IV Entertainment’s Daniel Hill, Big Machine’s Scott Borchetta and Jimmy Harnen, Avenue Bank’s Ron Cox, CMA’s Brandi Simms and CRS’s Bill Mayne. CMA unveiled a new medallion for the artists and writers behind Country’s chart-topping songs, which replaces the former CMA No. 1 plaque. Resembling the medals awarded at the Olympic games, both the recipients and attendees seemed very pleased with the change. “Well, here it is Monday. Must be time for another Scott Borchetta celebration,” quipped Jody Williams, getting big laughs from the crowd, before extending his heartfelt appreciation for the success and impact the Big Machine Label Group has had on our industry. Borchetta quickly added, “It never gets old, this community we have. This is exclusive to us and doesn’t happen anywhere else.” Borchetta then extended his own congratulations to the artists, writers and team behind the chart-topping success. Celebrating his third No. 1 song in eleven months, Eric Paslay greeted the crowd admitting, “It’s been a wild year.” Will Hoge added about the song, “It was so personal for Eric and I, we thought it would never connect because it was so personal. Eli Young took it and truly made it an anthem.” Originally released three years ago on his own album, the song is Hoge’s first No. 1 as a songwriter.